UK gamers may yet find copies of controversial videogame Manhunt 2 underneath the Christmas tree this year, following a decision by the Video Appeals Committee (VAC) to overturn the British Board of Film Classification decision to effectively ban on the game. Manhunt 2: will you be playing it this Christmas? Developer Rockstar submitted Manhunt 2 to the VAC after the BBFC refused a second time to certify the game. Vides and games can't be sold in the UK legally unless they are given a certificate which indicates the age groups for which they're suitable. Yesterday, the VAC's seven members judged in Rockstar's favour by just a single vote. It won four votes to three. 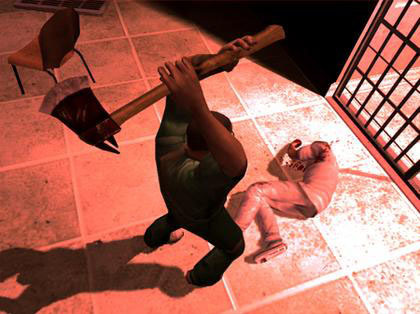 The BBFC, which claimed to have played Manhunt 2 for over 30 hours, refused to grant the game a certificate in June and then again in October because it felt that the title was too violent and bloodthirsty. Today, a BBFC spokeswoman told Register Hardware that the VAC’s decision doesn’t necessarily mean the game will appear on UK shelves straight away. The organisation will examine the VAC’s decision, she said. If it disagrees with the verdict then it can continue its fight to keep the game out of UK stores by seeking a judicial review at the English High Court. But if the BBFC decides to take the matter no further then Manhunt 2 will be granted a UK sales certificate. However, the spokeswoman warned that the game isn’t likely to receive anything less than an 18 certificate.